Many don’t care for the hustle and bustle, the crowds, the exposed mooring fields and to that I say, “to each his own.” We like the history, the architecture, the shops, the dining choices, the restaurants and did I mention food? We also enjoy one feature that receives no mention in the guide books; the Bridge of Lions and the amazing number of boaters who arrive and have no clue. A variety of charts and guides provide important information about opening bridges as well as fixed ones. How someone could travel and not have a paper chart or guide for the area is beyond me. We figure that many, especially if they are only traveling through an area once or are from say, France, don’t want to spend money on more charts. They use electronic ones on their chartplotters. Electronic charts are awesome must-haves and they do provide a great deal of information; the more you spend on features, they more info you have. But as far as we know, you can’t select a bridge and see its opening schedule. A typical exchange goes something like this: “Bridge of Lions, this is s/v Curious George standing by for your 12 o’clock opening.” Bridgetender: “Next opening is 12:30 captain.” Or my favorite: “Bridge of Lions, this is the northbound motor. Are you on a schedule, or on demand?” This is asked during the day. Bridgetender: “Next opening is 2 o’clock by request captain.” Oi! 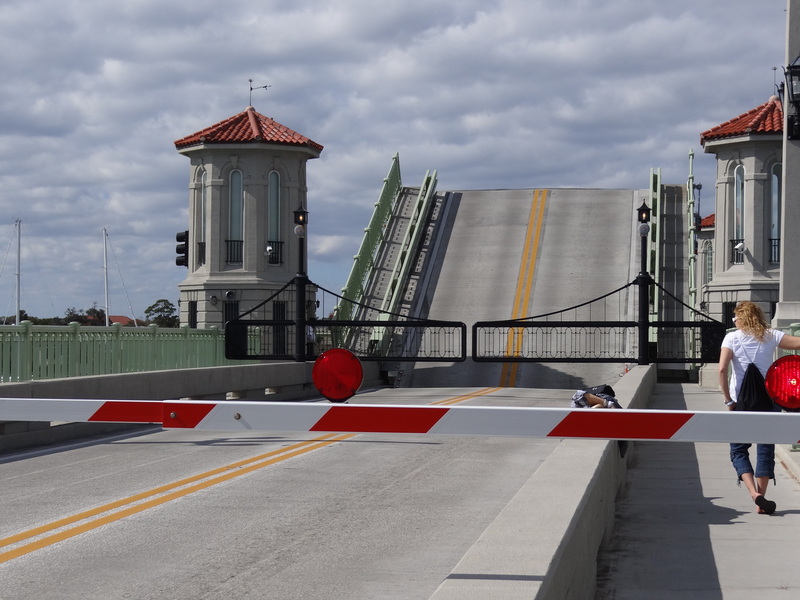 The bridge opens every half hour if boat traffic needs to pass through, but does not open at 8am, noon and 5pm. Before 7am and after 6pm the bridge will open upon request. A new one this visit was: “Bridge of Lions, this is s/v Local Guy. When is your next opening?” The bridgetender responds with , “Which direction captain?” Boater: “I’m coming from the Jacksonville side (meaning from north).” Bridgetender: “On request now captain.” We hear the pause indicating surprise at the captain’s good fortune at not having to wait for an opening. A fleeting thought darted in my mind that maybe this guy was local because of the Jacksonville reference. Most of us just say whether we are north or southbound. The next morning we hear s/v Local Guy call a bascule bridge further south and then say, “home port St Augustine.” Really? Local? And he doesn’t know or bother to find out the Bridge of Lions’ schedule? You can see that not all our fun times cost money. And as some may have guessed, yes we were monitoring VHF 16 and 9, to keep ourselves entertained in St Augustine when the rain kept us boat-bound. No sign of the daring duo Captain Rusty Nail and Missy, but if you missed their earlier adventures, check them out here. This entry was posted in Uncategorized and tagged bridges. Bookmark the permalink.